Oriana Peñaranda is a Training Program Coordinator at The George Washington University Center for Excellence in Public Leadership. Her current work at the Center includes assisting the coordination of the Program for Excellence in Municipal Management (PEMM), Executive Leadership Program (ELP), and Regional Executive Development Program (REDP). Oriana graduated from the University of Miami with a B.A. in International Studies and Economics. Prior to working for CEPL, Oriana dedicated a year of service as an AmeriCorps VISTA with Florida International University. 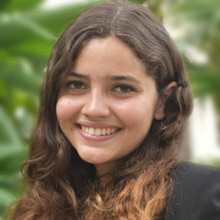 She served as the Volunteer Coordinator for the Center for Leadership and Service where she coordinated and advised FIU's Days of Service and Alternative Breaks program. Her steadfast belief in public service, leadership development, and community empowerment has lead her to pursue a Master's Degree in International Development Studies at GW's Elliott School of International Affairs. Oriana speaks fluent Spanish, English, and conversational Italian.